Race proven this past season with a 1st and 3rd placing at the 22 mile Tahoe race, stock division with Robert Stehlik and Kevin Seid; And 4th place at Battle of the Paddle elite women's race by team rider Andrea Moller. This model is designed to be stable to allow the rider to focus on paddling, yet maneuverable in bumps and small wave riding/ racing for all levels of experience. Maintains momentum to allow for distance paddling as well. Flat water and downwind models. Our flat water race boards opt for a rounded pin tail. 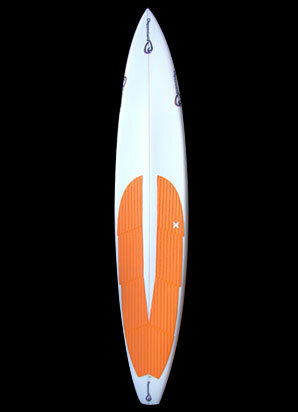 Downwinder board pictured with slight diamond tail. Custom dimensions available. Strong and light EPS/Epoxy construction. Shipping available in continental USA for all our boards. Designs and shapes by Kevin Seid.